At Euronext Amsterdam, BlackRock celebrates 10 years Women’s Initiative Network on International Women’s Day. With the opening of trading BlackRock honours International Women’s Day and celebrates the 10th anniversary of BlackRock’s Women’s Initiative Network (WIN). Cyrille Verbeeten, Vice President at BlackRock and Women in ETFs (WE) City Liaison Amsterdam, opens trading by sounding the gong. 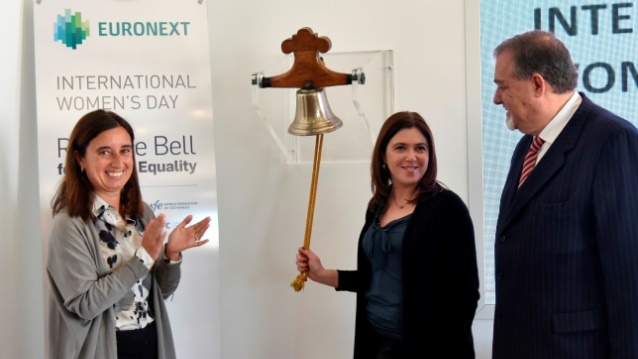 Euronext and 43 other exchanges organised an International event “Ring the Bell for Gender Equality” together with its partners UN Global Compact, UN Women, Sustainable Stock Exchanges Initiative, IFC, World Federation of Exchanges, Women in ETFs and local partner BlackRock in Amsterdam. WIN brings together leadership, innovation and passion to foster the full potential of women at BlackRock. International Women's Day (March 8) is a global day celebrating the social, economic, cultural and political achievements of women. The day also marks a call to action for accelerating gender parity. At Euronext Brussels, Françoise Chombar, CEO of Melexis, opened the trading day together with other female leaders and senior executives representing listed companies, banks, financial intermediaries and other associations such as Women on Board. Euronext Lisbon rings the closing bell with the Citizenship and Equality Secretary of State, followed by a welcome speech by Isabel Ucha, member of the Euronext Lisbon board. International Women's Day was concluded with a debate around "Empowerment: The conception of power within companies" The debate was lead by UN GCNP Network Representative, Mr. Mário Parra da Silva, whom initially addressed the UN's 2030 agenda for the contribution of Equality and Empowerment to Sustainable Development.